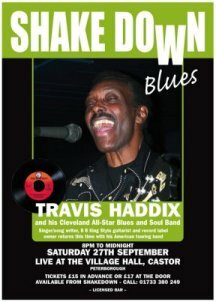 Travis Haddix (3)Travis Haddix was born in Hatchie Bottom, Mississippi in 1938, the son of the multi-instrumentalist bluesman Chamus �Rooster� Haddix and his wife Sylvia Keenon. Travis�s first instrument was the piano but he switched to guitar after seeing B.B King in the studio of Radio WDIA in Memphis. He moved to Milwaukee after graduation and then went on to Cleveland two years later and has remained there ever since. After a stint in the army Travis became serious about being a professional blues artist and joined a local R&B band �Earnest and the El Roccos� and at the same time worked with his elder brothers� band �Chuck and the Tremblers� recording with both outfits. Both bands accepted work wherever they could find it initially working in �buckets of blood ghetto joints� but eventually he was booked into the �finer places� including a show lounge called the �Plush Entertainment Centre�. Managing to obtain a residency of his own at the �Plush� Travis formed a band of his own which would also act as the houseband for �out of town� weekend star attractions including Denise LaSalle, Tyrone Davis, Bobby Blue Bland, Johnny Taylor and Little Johnnie Taylor. It was also at the �Plush� that he met and befriended Clarence Carter who recommended Travis to Ichiban Records in 1988. The Ichiban connection was good for Travis for, although not a great deal of care went into the production of the end products, the distribution network was good and it helped put his name in front of blues fans. They also encouraged his song writing skills which other Ichiban artists, especially Artie White, were keen to sample. Ten years and five albums later Ichiban was bankrupt. Travis started his own record label Wann-Sonn and began to concentrate on high production standards. This decision began to pay-off when in 2000 the issue of the CD �Old and Easy� prompted editor Andy Grigg of the prestigious Canadian blues magazine �Real Blues� to begin a campaign to establish Travis� credentials amongst the blues elite. This campaign was helped by the release of the excellent CD �Milk and Butter� the following year and the even better �Company is Coming� made him a force to be reckoned with. The superb 2003 release �Blues from Staghorn Street� coincided with a telephone call from Travis asking me to organise a gig for him in England and I naively obliged. A date was set for January 2004. That night a small crowd of enthusiastic friends and relations bought truck loads of Travis� CD�s and the Shakedown series was re-born. The heavy Mississippi University based Living Blues Magazine got to hear about the gig and made Travis the featured artist in the 2005 issue # 179. Since then bookings keep rolling in for festivals and club dates throughout the world including the Hawaiian Blues Festival (must include that in my itinerary for 2009) and regular lengthy tours in Scandinavia. Since we last saw Travis in January 2007 with the Mike Carr Band he has recorded two excellent albums �Mean Ole Yesterday� and �Daylight At Midnight� which were released on Wann-Sonn Records.